So you spent New Year’s Eve on Puerta del Sol? A very good start of the year, but you were probably surrounded by foreign tourists: the Spanish watch the clock on television and prefer to avoid the flying cava bottles, the cold feet and the drunk Italians. For a more castizo celebration next year, opt for the San Silvestre Vallecana run instead. The run, better known as San Sil, is a 10 kilometer tour through the city centre from the Bernabeu stadium to Vallecas. And 10 kilometers, that is a little bit more than an hour of exercise for the moderately trained. Do not be afraid: with just a few months of training even the biggest couch potato will be able to reach the finish line. Your reporter –not the most athletic person in the world- just finished her fifth and is the living proof that anybody who wants to can face the test and come out alive. But the San Sil is most of all a wild race through the very city center, with dressed up people -note: for reasons still unknown, Spanish men prefer to dress up as women, with stockings, hairy legs and enormous plastic bosoms-, an audience you will never again have in your life, lots of music, an outstanding organization and an excellent Runner’s High at the end so you can go on and have fun at any party later that evening or simply go to bed and be happy with that as well. Where else can you find Chema Martinez, a butanero, a group of bulls and their picadores, Ana Botella, a team of nurses and Superman (some real, some of them dressed up) in the very same street waiting for the cue to flood the city centre? So write in your agenda for this year that in September you need to start training –plenty of schedules to be found on the internet- and that from the beginning of November you will need to check the website www.sansilvestrevallecana.com daily. When sales start, reserve your place immediately. The 35.000 dorsales sell out within a week. 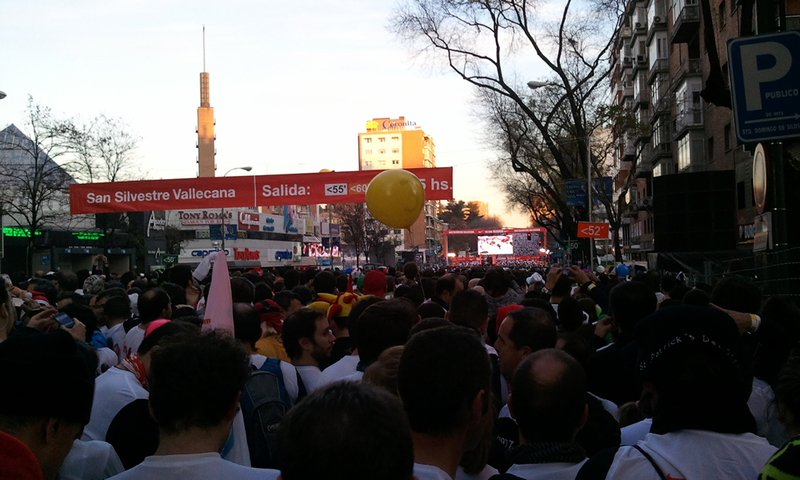 This entry was posted in Sports and tagged San Silvestre Vallecana 2011. Bookmark the permalink.